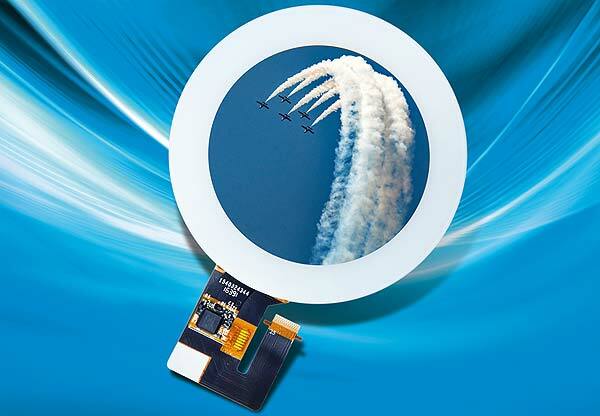 This TFT display stands out from the crowd with its design: The active surface of the TM033XDHG01 from TIANMA Europe is round and thus enables unconventional designs. Its high brightness and its ability to operate at high and low temperatures make it the ideal display for outdoor equipment. The luminance of 750 cd/m2 combined with a high contrast ratio of 1:800 provides the TM033XDHG01 with excellent readability even in direct sunlight. A service life of 20,000 operating hours at temperatures between -20°C and +70°C testifies to a robust, industrial design that meets the demands of the industry. With an active area diameter of about 60 mm, the display module offers a resolution of 320 x 320 pixels. The display is able to reproduce 16 million different colour gradations using the dithering process. The viewing angle is 70 degrees from almost all sides. Weighing only 22.5 grams, the TM033XDHG01 is also an ideal display module for mobile devices.